A difficult, complex, engrossing tale. Let me focus on the plot structure, the world building, and the major theme of living within unjust social structures. (See also a slightly more detailed review on my blog: http://examinedworlds.blogspot.com/20...). The plot follows three separate threads: Essun, a woman in search of vengeance against her son's murderer, Damaya, a girl going to a school for a magic that allows people to control geological forces, and Syenite, a woman ordered to go on a mission with a man she detests. The three threads seem unrelated at first, but they come together as the book goes on (to say how, exactly, would be an unforgivable spoiler). This makes for a fascinating structure. The Essun storyline is told in the second person, so that "you" do this and that. I was a bit worried at first that this would seem gimmicky or artificial, but somehow it works and even makes for an interesting style. You might worry that the whole book is in the present tense, but this also works surprisingly well. All of this structural and stylistic uniqueness did sometimes make the book a bit difficult, at least for me. I sometimes had to go back and re-read sections from dozens or hundreds of pages earlier to remind myself what each character had been through. The world building is amazing. The Stillness (the sarcastically-named continent where it all takes place) is on a world of intense geological activity, which every few hundred years creates a "Fifth Season" that wipes out a lot of the life on the planet. World building aficionados will love the historical appendix that tells the history of each Fifth Season going back several thousand years. There's also a glossary for more general terms, which is helpful for forgetful readers like me (although most of the terms can be understood in context in the novel). You can tell that this is the first book of a trilogy, so while I look forward to learning more about the characters, I'm most interested to learn more about the world. The major philosophical theme has to do with social injustice. Each plot thread involves characters who come to realize that they are both persecuted by and benefit from unjust social structures. The magic users are called "roggas" and are almost universally feared and hated. They can control geological forces, but they themselves are controlled by the Guardians. In the Syenite storyline, she's even ordered to have a child with a man she detests (they later have a complicated relationship). Most of the characters in the book come to see that they are part of a system that dehumanizes some people at the expense of others, but it's not clear how to live within the system much less how to change it. Many of us here on Earth are similarly convinced that we live in - and perhaps benefit from - unjust social structures: people in wealthy countries benefit from poverty in the developing world while those in extreme poverty are dehumanized and exploited, white people and men benefit from institutional racism and sexism while people of color and women struggle against systemic inequality and degradation, etc. While none of us magically control geological forces, The Fifth Season encourages readers to spend some time in another world to reflect on what powers we might have to improve this one. Coda: I'm voting for the Hugos for the first time this year. As of now for my vote for Best Novel it's between this and Neal Stephenson's Seveneves (See my review: http://examinedworlds.blogspot.com/20...). It's a tough call, but I think I'm going to have to go with The Fifth Season. 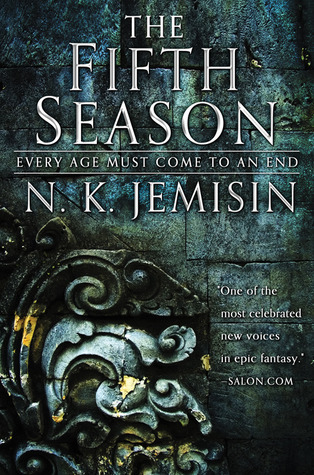 Sign into Goodreads to see if any of your friends have read The Fifth Season.